Each year, approximately 300,000 new cases of cancer affect children under the age of 19 worldwide. More than 15,000 of these children are located in the United States alone. Despite the statistics, pediatric cancer researchers and doctors continue to face challenges. Only three new drugs have been approved by the FDA specifically developed to treat children with cancer over the past 23 years. Research through clinical trials continues to be critical in finding successful treatment for pediatric cancer. In fact, most progress made in identifying curative therapies for childhood cancers has been achieved through clinical trials. 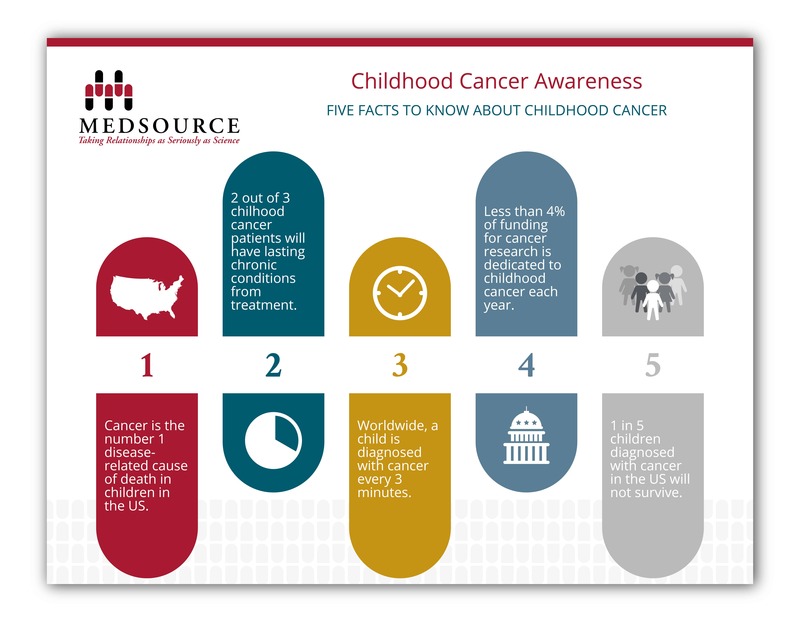 MedSource is proud to support Childhood Cancer Awareness Month. We ask that you join us in our efforts to make a difference in the lives of children worldwide suffering with cancer. Help us spread awareness and educate the community on the types, treatments, funding and facts of pediatric cancer. We promise to continue keeping our focus on complex study designs and diseases, applying our particular expertise in oncology. To join the fight or to learn more, visit the American Childhood Cancer Organization at www.acco.org.